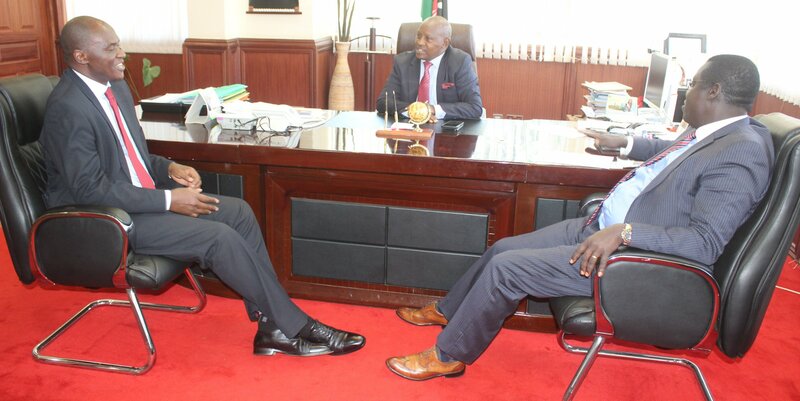 Ministry of Health PS Prof Peter Tum paid a courtesy call to Nyeri Governor H.E. Mutahi Kahiga on 11th November 2018 in regards to the upgrade of Othaya Teaching and Referral Hospital. Prof Tum also visited the Hospital to check on the progress of the hospital where he is expected to brief H.E. President Uhuru Kenyatta on the progress. H.E The President will preside over the official opening on a date to be announced later. Last week during the visit to Nyeri County, President Kenyatta promised Nyeri residents that he will return soon to open the health facility in Othaya. The hospital was handed to the National Government a few months ago by the County Government of Nyeri. The opening of the Referral Hospital is expected to benefit Nyeri and neighboring counties and also ease congestion at Nyeri County Referral Hospital (PGH). Local leaders have since suggested that the hospital should be renamed Mwai Kibaki Teaching and Referral Hospital.